A Roman aqueduct at Pont du Gard, France, was built around 19 B.C.E. It is one of France's major tourist attractions and a World Heritage Site. An aqueduct is an artificial channel that is constructed to convey water from one location to another. The word is derived from the Latin aqua, "water" and ducere, "to lead." Many aqueducts are raised above the landscape, resembling bridges rather than rivers. Structurally, they are similar to viaducts, which is a bridge composed of several small spans constructed over land or water. Viaducts are are used for roads or railways. Aqueducts have been built to supply water to large cities and to irrigate agricultural lands. If they are sufficiently large, they may also be used for transportation, allowing barges to cross ravines and valleys. View from inside a Roman aqueduct, from the Pools of Solomon to Jerusalem. Although famously associated with the ancient Romans, aqueducts were devised centuries earlier in the Middle East, where people including the Egyptians built sophisticated irrigation systems. Roman-style aqueducts were used as early as the seventh century B.C.E., when the Assyrians built a limestone aqueduct 30 feet (10 meters) high and 900 feet (300 m) long to carry water across a valley to their capital city, Nineveh. The full length of the aqueduct ran for 50 miles (80 km). In the New World, the Aztec capital of Tenochtitlán was supplied with water by two aqueducts in the middle of the second millennium. Roman aqueducts were built in all parts of the Roman Empire, from Germany to Africa, and especially in the city of Rome itself, where they totaled over 260 miles (416 km). The aqueducts were important for supplying water to large cities across the empire, and they set a high standard of engineering that was not surpassed for more than a thousand years. 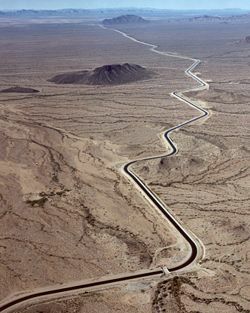 The Central Arizona Project Aqueduct, the largest and most expensive aqueduct system ever constructed in the United States. 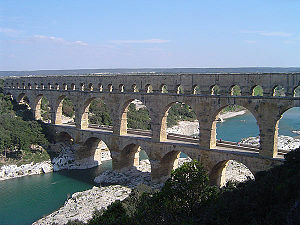 Much of the expertise of the Roman engineers was lost in the Dark Ages, and in Europe the construction of aqueducts largely ceased until the High Middle Ages. An example of an extant small scale aqueduct system built in 1202 by Cistercian monks is the Spanish Real Monasterio de Nuestra Senora de Rueda, whose central heating and waste disposal system relied upon a series of aqueducts originating from a diversion of the Ebro River. 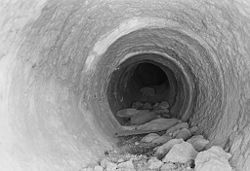 Through most of the Middle Ages and even up to the nineteenth century, water was instead usually supplied through the digging of wells, though this could cause serious public health problems when local water supplies became contaminated. One notable exception was the New River, a manmade waterway in England, opened in 1613 to supply London with fresh drinking water over a distance of 38 miles (62 km). The development of canals provided another spur to aqueduct building. The nineteenth century saw aqueduct building resume on a large scale to supply fast-growing cities and water-hungry industries. The development of new materials (such as cast iron) and new technologies (such as steam power) enabled significant improvements. For instance, cast iron permitted the construction of larger, more highly pressurized inverted siphons, while steam and electrically powered pumps enabled a major increase in the quantity and speed of water flow. England led the world in aqueduct construction, with notable examples being built to convey water to Birmingham, Liverpool, and Manchester. 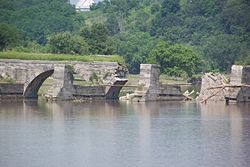 Remains of the Schoharie Crossing, an aqueduct that once carried the Erie Canal over the Schoharie Creek near Amsterdam, New York. In modern times, the largest aqueducts of all have been built in the United States to supply its biggest cities. The Catskill Aqueduct carries water to New York over a distance of 120 miles (190 km), but it is dwarfed by aqueducts in the far west of the country, most notably the Colorado River Aqueduct, which supplies the Los Angeles area with water from the Colorado River nearly 250 miles (400 km) to the east, and the 444 mile (714.5 km) California Aqueduct which runs from the Sacramento Delta to Lake Perris. 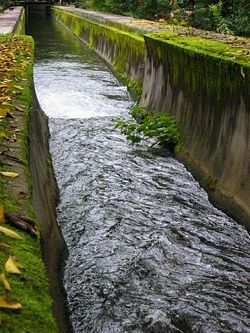 Water channel of the Nanzen-ji aqueduct in Kyoto, Japan. Historically, many agricultural societies have constructed aqueducts to irrigate crops. Archimedes invented the water screw to raise water for use in irrigation of croplands. Another widespread use for aqueducts is to supply large cities with clean drinking water. Some of the famed Roman aqueducts still supply water to Rome today. In California, three large aqueducts supply water over hundreds of miles to the Los Angeles area. Two are from the Owens River area, and a third is from the Colorado River. In more recent times, aqueducts were used for transportation purposes to allow canal barges to cross ravines or valleys. During the Industrial Revolution of the eighteenth century, many aqueducts were constructed as part of the general boom in canal-building. In modern civil engineering projects, detailed study and analysis of open channel flow is commonly required to support flood control, irrigation systems, and large water supply systems when an aqueduct rather than a pipeline is the preferred solution. The aqueduct is a simple way to get water to other ends of a field. In the past, aqueducts often had channels made of dirt or other porous materials. Significant amounts of water were lost through such unlined aqueducts. As water gets increasingly scarce, these canals are being lined with concrete, polymers, or impermeable soil. In some cases, a new aqueduct is built alongside the old one because the water supply cannot be shut down during construction. The Eupalinian aqueduct on the Greek island of Samos. An ancient subterranean aqueduct. Roman aqueduct supplying Carthage, Tunisia. Aqueduct of Valens in Istanbul, Turkey. Päijänne-tunneli is 120 kilometers long underground aqueduct (continuous tunnel) connecting lake Päijänne to Greater Helsinki. Levadas, 1350 miles of seventeenth century aqueducts on the Portuguese island of Madeira. Quabbin Aqueduct, 24.6 miles long tunnel, in Massachusetts, United States. Chicopee Valley Aqueduct, 13.1 miles long, in Massachusetts, United States. California Aqueduct, a 444 miles (approx. 714.5 kilometers) long combination of canals, pipelines and tunnels, United States. Benjamin Outram's 44-foot-long single-span Holmes Aqueduct on the Derby Canal in Derby was the world's first navigable cast iron aqueduct, narrowly predating Thomas Telford's 186-foot-long Longdon-on-Tern Aqueduct on the Shrewsbury Canal, sometimes described as the world's first large-scale navigable cast iron aqueduct. Pontcysyllte Aqueduct carries the Llangollen Canal over the River Dee valley in north Wales, and was designed by Thomas Telford and opened in 1805. The same canal, which includes a tunnelled section crosses a second valley on the Chirk Aqueduct. This navigable canal also supplies water to the borough of Crewe and Nantwich. Union Canal in Scotland has many aqueducts, including the Slateford Aqueduct that takes the canal over the Water of Leith, the Almond Aqueduct over the River Almond at Ratho and the very impressive Avon Aqueduct over the River Avon. This is the second longest aqueduct in the United Kingdom. In recent years the building of the Lichfield Aqueduct prompted the UK government to pass legislation preventing a road being built in the path of a canal being renovated without providing a tunnel or aqueduct for it to pass. Barton Swing Aqueduct - a form of swing bridge that carries the Bridgewater Canal across the lower Manchester Ship Canal. A 234-foot section of the aqueduct rotates through 90 degrees to allow vessels to pass along the Ship Canal. The Magdeburg Water Bridge in Germany connects the Elbe-Havel canal to the important Mittellandkanal. Nearly 1 km long, it is the longest Water Bridge in Europe. Sextus Julius Frontinus, De Aquaeductu Urbis Romae (On the water management of the city of Rome), Translated by R. H. Rodgers, 2003, University of Vermont. Retrieved December 3, 2007. Aqueduct originally from Encyclopædia Britannica, Eleventh Edition. (1911) Retrieved December 3, 2007. This page was last modified on 9 April 2016, at 16:36.